Spring greetings! I hope this message finds you well. It has been an exciting first few months operating Holsten Galleries as a virtual on line glass gallery from beautiful Santa Fe. 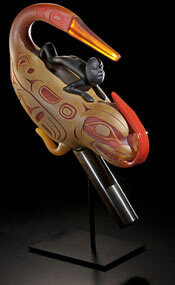 I want to share with you some news at Holsten Galleries virtual. 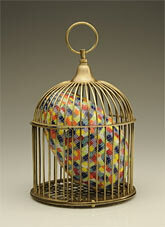 This recently completed piece by Preston is one of the most interesting examples of his popular “Rattle” series. This particular piece is certainly one of the most graceful and lyrical works in this well known series by the Maestro. This is a magnificent example of Ginny’s exuberant, magical artistic expression. 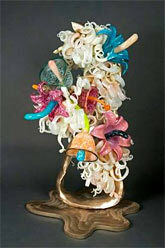 Standing at five feet, this sculpture combines glass and bronze in an imposing, multi-colored floral fantasy. 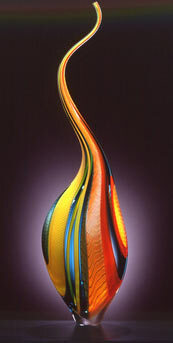 Paul Stankard’s mastery in glass never fails to amaze. 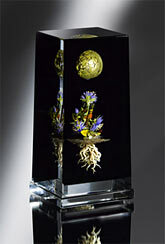 It bends the mind to see so much detail and such perfection in a sculpture which is just under 8″ in height. Evident in this piece are both Marquis’s playfulness and also his technical mastery. Holsten Galleries will present a one-person exhibition of all new works by Maestro Lino Tagliapietra at the second annual SOFA-West show in Santa Fe, New Mexico. I am particularly excited about this event as I am now living in Santa Fe full-time. An online catalog will be available sometime in May. I hope that Lino and I will see you here in July! 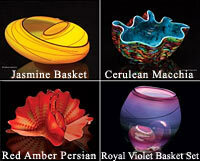 The much anticipated 2010 Studio Editions by Dale Chihuly are now available! As you can see, these are some of the most beautiful to date. I also have access to a limited number of Studio Editions from previous years. Please call or email me for pricing. Thank you for your many expressions of support for my “new” venture. I wish you all a happy, healthy spring and summer and look forward to keeping in touch!